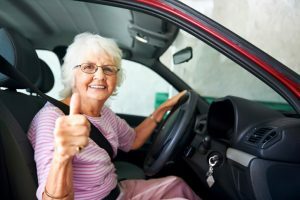 So if you’re concerned about how hearing loss will affect your driving skills, here is how you can stay safe while driving with hearing loss. Summertime is a great time for road trips. But before you hit the open road, consider your hearing ability. Hearing loss can interfere with your ability to drive safely. Even taking local roads and highways you are already familiar with can be risky when you have hearing loss. There are many noises and sounds you should be able to hear clearly, recognize, and respond to when you’re behind the wheel. So if you’re concerned about how hearing loss will affect your driving skills, here is how you can stay safe while driving with hearing loss. You can easily get distracted while driving. Even when you are not driving with hearing loss, you can be distracted by your phone or by the radio. Sending or reading text messages while you drive is dangerous because it can cause crashes and other potentially traumatic accidents. And if you do have to answer a phone call or place one, it’s best to pull over and stop somewhere safe first. That way you can give your full attention to the person on the other end and not take your attention off of the road ahead. As we touched on above, music that is too loud can harm your hearing. But when you’re driving, turn the music down. Your hearing loss might make it more difficult to enjoy your music, but simply turning the volume up to compensate is not a safe solution. You have to be able to hear sounds coming in from outside your vehicle, and listening to music can interfere with your ability to do that, especially when you are driving with hearing loss. Emergency vehicles equipped with loud sirens might be coming your way – and if you can’t hear them coming, you might not be able to move out of their way in time before they reach you. Good vision is important for driving safely. When you have hearing loss, you might have to rely on your eyes even more. Keep your eyes open for changes in traffic patterns and when the stoplights change colors. You should also constantly check your mirrors, both your side mirrors and your rearview mirror. You might not be able to tell how far away other cars or people are without good hearing. But in this case, your eyes can help make up for your ears. Driving with Hearing Loss? Trust Clarity Audiology! This entry was posted on Friday, July 21st, 2017 at 2:57 pm. Both comments and pings are currently closed.